This post was originally published here at AMR on 12/20/16. We rarely got anything in our stockings when I was growing up. My parents had a hard enough time being able to put a few gifts under the tree. They didn't see the point of wasting money on little things that ended up getting broke or lost within a week. On the rare occasions that we did have something in them, we would find an orange, apple, or candy cane. The fruit wasn't that big of a deal because we had access to fresh fruit all year, but that wasn't always the case for people in Appalachia. I remember trying to return the favor by giving him one of a pair of oranges that the teamsters had left as a treat. Bear had not experienced oranges before, and he watched me eat mine before he started on his own. It took him an hour to finish. He peeled it slowly and studied the differing sides of the peels and smelled them and smelled his fingers. Then he ate each section very slowly, sniffing each one before he put it in his mouth. He savored every moment of his consumption of that orange. When he was done he collected all the pieces of peel and dried them in the sun like deer jerky. A month later, they had lost most of their color, but they still held the ghost of the orange's aroma, and Bear kept them in a gourd sealed with a wooden stopper to hold in the scent that would have to do him until another orange made its way into the mountains. There is some history behind Christmas oranges. St. Nicholas was a bishop before he became a saint. The legend says that he rode through a town where a storekeeper had three beautiful daughters and couldn't afford to offer a dowry for them. This meant that the girls would become destitute once their father passed away. Bishop Nicholas knew that the father was a proud man so he tossed three sacks of gold through an open window (or chimney depending on who is telling the story) while the family was sleeping. 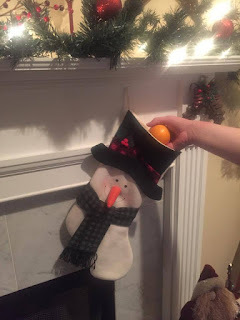 One of the bags landed in the toe of a stocking that was hanging by the fire to dry. When the family got up the next morning, they found the gold, including the one in the stocking which had turned into a ball overnight. Giving an orange today is a way to celebrate generosity without expecting anything in return. It symbolizes that gold ball and is a reminder to care for those in need. Who knew there was so much behind a piece of fruit in a Christmas stocking? Did you get an orange in your stocking? The Great Debate: How do you like your grits?